For the last time Formula One visits India and a track where there has only ever been one winner. What will ensue when F1 hits India for the last time? 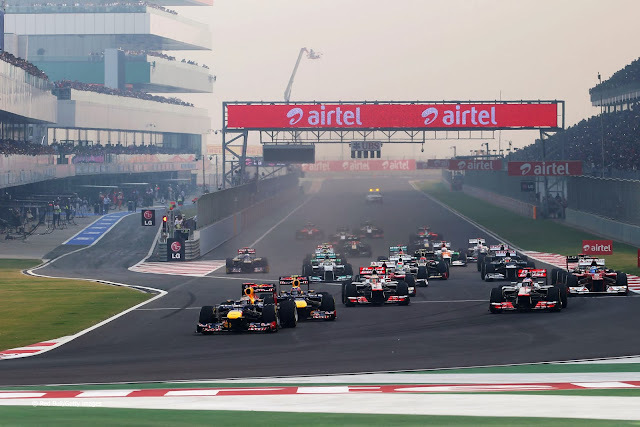 The start of last years Grand Prix at the Buddh International Circuit, India. Ok, lets just get this out of the way. On Sunday 27th October, Sebastian Vettel will be crowned this years F1 World Champion. The only realistic course of events that could stop this from happening would be a retirement. He only needs to finish 5th or higher to win the championship no matter where his rivals finish. Who won last year? Vettel. Who won the previous year? Vettel. Who is the only F1 driver to have ever led the Indian Grand Prix? Vettel. Should I go on?! Jenson Button hopes to record the first podium of the year for McLaren. Let's hope he's not driving this though. So what of the Grand Prix and circuit? The Buddh International Circuit is located in Greater Noida near New Delhi. There will be 60 laps and the lap length is 3.2 miles. The circuit is similar to Korea in terms of a mix between several long straights and some fast corners. Perfect for a Red Bull! Tyre management will once again feature here as it is a medium downforce track but a very green one as so few events are held here through the year. Car set ups will be key. Pit stop strategy will also be key, I am expecting 2 stops to be the fastest way round but as demonstrated by teams at Japan things could change from lap to lap depending on tyre deg! So enjoy the race, one of the last times we get to hear the roar of the V8`s before next season`s change to the somewhat tinny little V6 turbo`s! The sound of things to come! No its not a food blender! Is it?! This is Formula One, anything can happen and it usually does! Bring on the weekend, bring on the Indian Grand Prix! We'll have you covered! Full preview for the F1 Indian Grand Prix 2013.